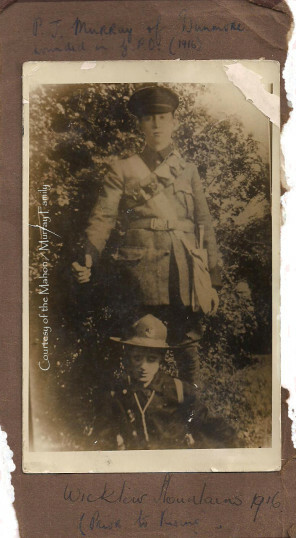 Patrick J Murray, Irish Volunteer, in the Wicklow Mountains prior to Easter 1916. Courtesy of the Mahon / Murray Family. Patrick was the eldest child of Thomas P. Murray of Dunmore and his wife Nannie (nee Larkin) of Mountbellew, who were both primary school teachers. Patrick spent his early years, together his parents and 3 brothers and 3 sisters, in Gater Street, Dunmore (later known as Sion Hill). According to his Military Pension files (under references MSP34REF2498, available online) Murray stated that he joined the Irish Volunteers, at the opening meeting at the Rotunda in November 1913. He was at that time working as a Shop Assistant with the Flemming Bros in Drumcondra, Dublin. From approximately 1922 until late 1924 he worked as a Clerk with the Ministry of Defence at Portobello Barrack. Patrick married Mary Josephine (nee Kelly) on 8th August 1921. Their one child, James Thomas (also known as Seamus), was born on 20 June 1922. Seamus died young, sometime after 1948. In about 1925, after Mary inherited her family home at 52 Lindsay Road in Glasnevin, they opened a grocery business at 12 North King Street, where they lived above the shop. They remained there until the early 1940s when the Murrays closed their business. They then moved to 14 Villa Bank, Phibsboro. Patrick worked as a Lighter worker between December 1942 to June 1946 and then as a Temporary Clerk (grade III) from then until his death in April 1952 at Collins Barracks. Sometime afterwards Patrick’s widow, Mary, moved to 1 Gartan Avenue, Iona Road, Glasnevin. In details provided in his Pension file Patrick advised that as an Irish Volunteer he was engaged in the Howth Gun Running in July 1914 and shortly afterwards in the gun running in Kilcoole (Co. Wicklow). For several weeks prior to the Rising he was engaged in bomb making and during Holy Week spent time bringing the bombs and equipment to Liberty Hall and other sites. In one form on his file Patrick states that he assembled with his Company on Easter Monday under the Command of Tom Byrne and went to the GPO. While there he defended the site from British attack and was in ‘charge of two windows (with six men under my command) until Friday. When the GPO was on fire, I joined O’Rahilly’s party in an attempt to fight our way through Moore Street’. While in Moore Street, shortly after evacuating the GPO on Friday 29th April, he suffered a gunshot wound to the right leg, below the knee. He further stated that he was then taken to the Dublin Castle Red Cross Hospital as a prisoner on 30th April, and was detained there until he was sent in July to Frongach, in Wales, until December 1916. After his release he assisted with the organisation of his old Company (B Company, 1st Battalion, Dublin Brigade) as Quarter Master, and was in charge of its various arms dumps and books (with names and addresses of its members). Frank Daly was Captain of the Company. Patrick served in ‘that capacity all through the Black and Tan period until the Truce’ (31 May 1933). During that time, he worked as Manager of the Co-operative Stores at 69 Phibsboro Road, and used the store for the distribution of arms and munitions. Patrick’s extensive wound pension file contains much correspondence between him and the Pension’s Board relating to his wound pension claim. Documents on the file reveal that Patrick’s leg was operated on in 1924 to remove a scar, and sent seven weeks in hospital. He was subsequently awarded a temporary pension of £40 per annum, for the period 22 April 1922 to 31 May 1924, and thereafter awarded a gratuity of £75. However, over the years Patrick continued to seek a review of his case, such as under new legislation like the Military Pensions Act of 1932, and then as his condition continued to cause him pain as he aged. However, the Board continued to refuse his claim. In a letter dated 16 June 1950, addressed from 14 Villa Bank, he advised the Board that his leg suffered ‘from ulceration and general inflammation of the limb, which causes me great pain and discomfort and caused me to retire from business as I was unable to do any work standing and I find it difficult to walk without the aid of a stick’. He requested that his file be re-opened and reviewed again. After further examination the Board proposed in November 1950 to agree to pay a pension of 20% for the period 19 September 1950 to 30 September 1952. However, the Board was still awaiting the appropriate sanction before the payments could be made when Patrick died on 18 April 1952. His widow Mary then pursued the matter. Finally in December 1953 a gratuity payment of £69.12.1 was sanctioned to be paid to Mary under Section 12(1) of the Army Pensions Act 1949. She was at that time advised that as Patrick ‘was not in receipt of a wound pension at the date of his death it is regretted, accordingly, that your application for an allowance does not come within the scope of the Act’. Though Patrick was not in receipt of a wound pension during his life, he was since 1937 (but effective from 1 October 1934) in receipt of a service pension of £28.8.8 per annum (File E1953). This was granted under the Military Service Pension Act of 1934. According to his obituary his funeral was held in Berkeley Street Church and he was buried in Glasnevin Cemetery with military honours. The above information was extracted from Murray’s Military Pension files, and also supplied by his descendants, who also gave their kind permission to use the attached photograph. Military Pensions http://mspcsearch.militaryarchives.ie/detail.aspx, Military Archives. Pension File, 7 May 1952, http://mspcsearch.militaryarchives.ie Military Archives, accessed November 2015. Pension File, 25 February 1935- http://mspcsearch.militaryarchives.ieRRAY/WMSP34REF2498PATRICKJOSEPHMURRAY.pdf. Military Archives, accessed November 2015. Pension File, http://mspcsearch.militaryarchives.ie Military Archives, accessed November 2015. My grandfather was Patrick’s first cousin. To the best of my knowledge there are no direct descendants to Patrick. Does anyone know this to be incorrect? I am looking for information on Patrick. Can anyone identify the young man in the Fianna uniform? John, you and I are related. My grandfather was Patrick’s cousin. His mother was Patrick’s father’s sister, one of three Murray sisters who emigrated to the U.S. back in 1880. I’ve set up a Facebook page for the Donnellon and Murray families from Dunmore. Patrick Joseph Murray was my grand-uncle, and I would like to hear from any of his descendants. As far as I am aware he is the only man from North Galway who was in the GPO in 1916.